Sentient spaces are simply spaces containing sensors: registering heat, light, sound, impact and other signals derived from movements, properties, and other aspects of the environment. After all, the Latin sentīre is to feel (OED). Spaces saturated with CCTV coverage also contribute to spatial sentience, and spaces laced with networks, software, and storage media through which these signals pass. Add to these spaces actuators that make changes by adjusting heat, light, and sound, and open and shut doors, traps, gates, flues, windows and walls and you have complex feedback loops, control systems and responsive environments. More compelling still is the integration of these sensors and actuators with networks, wireless Internet, interconnected mobile devices, screens, and display surfaces connected with systems and people in other spaces. Add to this responsive world interconnected moving and warping bio-mechanical planes, textures, sounds, sights and vapours, and you have something close to a hyper-natural environment, especially if such spaces process large quantities of information automatically, respond, reproduce, propagate, and deal with problems — i.e. they select, decide and produce meaningful actions. It looks as though I’ve slipped here from control systems to so-called “higher-order cognitive processes,” and the idea of autonomous, artificially enhanced spaces filled with high level distributed cognition. What I’ve outlined also echoes some of the claims made of the sentient city as promoted by cultural geographers and social scientists such as Nigel Thrift, and architects such as Mark Shepard. Do claims about the sentient city parallel what people say about organic life? I stumbled across news online that “The New Zealand Government has formally recognised animals as ‘sentient’ beings by amending animal welfare legislation” (The Independent 2015). According to the Encyclopaedia of Buddhism (available online), “Sentient beings is a term used to designate the totality of living, conscious beings” (760). Is there a sense in which cities are (or are becoming) self aware? According to Thrift, it’s fair to say they are, but in a way that expands what we mean by awareness. Thrift counsels: “The claim is not being hoisted that the city is aware of itself in any human way. Rather, the claim is being made that, as computational objects have developed, cities are able to take on new forms of vitality” (10). Space assumes a cognitive dimension, as “other kinds of sentience are possible” (4). Beyond sentience there’s sapience. In his edited book Sentient City Mark Shepard suggests that sentient spaces do not necessarily exhibit sapience (sapere is to know): “So a sentient city, then, is one that is able to hear and feel things happening within it, yet does not necessarily know anything in particular about them. It feels you, but doesn’t yet know you” (31). “Self-knowledge: The sense of awareness of our own existence. Access to information: The introspective response to our own knowledge. Concepts of sentience, awareness and consciousness seem to focus on individual entities, such as people, other organisms and their putative surrogates as robots. Sentience is usually about individuals and what’s in their heads. So how can it be applied to cities? There’s a body of theorists happy to move cognition out of the skull. In Mood and Mobility, and drawing on several sources, I outlined the various sites to which scholars attribute moods such as joy. Some say it’s in the brain, others refer to the whole body. For some, such moods and feelings are in an ensemble that includes the environment we are in, it’s shared within groups, and evident in relationships. From another angle, emotions are in the language we use, or something we participate in ontologically, i.e. prior to or beyond the categories of subject, object, community, and space. See Where does happiness happen? Some scholars discuss sentience, awareness, sapience, and consciousness in a similar way to mood and cognition. That would seem to add support to the proposition that we are entitled to extend the concept of sentience into the environment, even before the introduction of electronic and digital communications. We didn’t really need digital networks to make our cities sentient or “aware.” At best elements of the wired and wireless city brought the issue into prominence, perhaps revealing what was there all along. Shepard, Mark. 2011. Toward the sentient city. In Mark Shepard (ed. ), Sentient City: Ubiquitous Computing, Architecture, and the Future of Urban Space: 15-45. Cambridge, MA: MIT Press. Thrift, Nigel. 2014. The ‘sentient’ city and what it may portend. Big Data and Society, (June)1-21. It’s interesting how much scifi dealing with cognition focusses on autonomous, spatially discrete entities called robots, and yet if there’s any validity to the notion of artificial intelligence then there’s no necessity for such capability to be so spatially focussed. I like Heidegger’s inversion of the whole subjectivist, Cartesian construct. Descartes proposed that we start our philosophical investigation into understanding the world with a notion of the thinking, aware, individual self. Contrary to Descartes, Heidegger says we should start with the unreflective, unselfconscious, worldly engagement with everyday tasks as the beginning of all understanding. From a Pragmatic and Structuralist angle it’s perhaps easier to grasp that consciousness, sentience and awareness are terms in language, and that they have particular use value in particular contexts. For example, Thrift prefers the term “awareness rather than consciousness because it is much less loaded with expectations” (19). The idea of a city with consciousness perhaps tips such speculations too far in the direction of science fiction. The image above is of the control panel for a home heating control unit that can be accessed via the Internet, GPS and my smartphone. 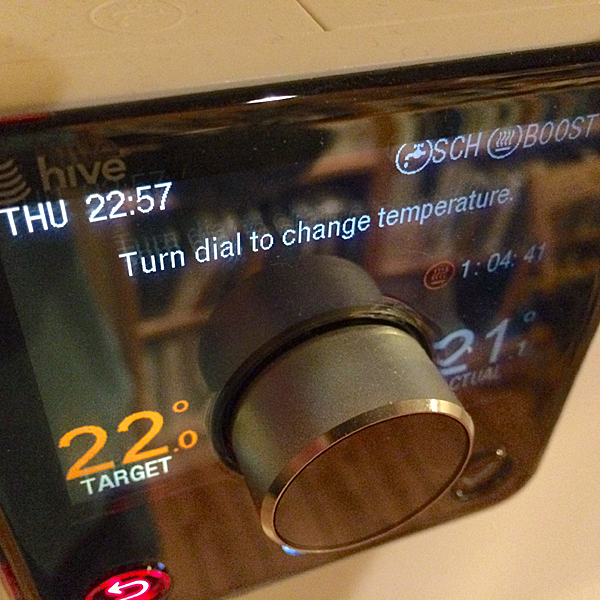 I get a message when I’m on the way home that I might like to give the heating a boost.